QUICK! What*s the capital of California? Who played Forrest Gump? What*s 5 X 16? What animal is the *King of the Jungle*? What letter comes before *J*? 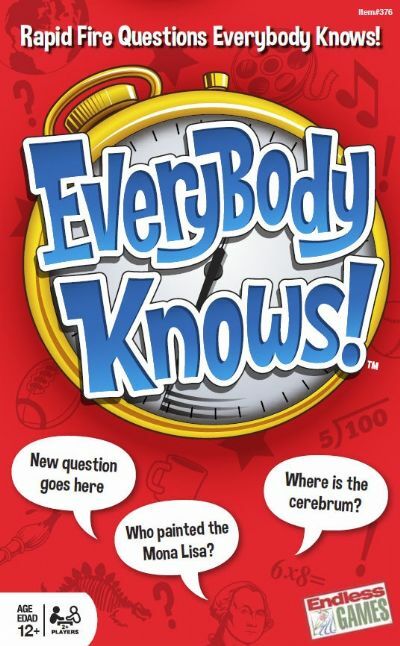 What new game is all about answering questions EVERYBODY KNOWS the answers to in 60 seconds or less? Sure, the questions may seem easy, but try going 10 for 10 in 60 seconds! It*s the game of questions Everybody Knows… but can you answer UNDER PRESSURE? For 2 or more players. Ages 12 and up.